Down-range management and military commanders concerned with missions being compromised by threats to personnel and critical or high value assets from hostile military action or terrorist threats must second guess the adversary. Many facilities in terrorist-prone regions do not have the luxury of large standoffs from public roadways or may be susceptible to sniper fire or RPG and indirect fire attack. Remagen designs and manufactures Expeditionary Tactical Buildings meeting blast and terminal ballistics requirements. 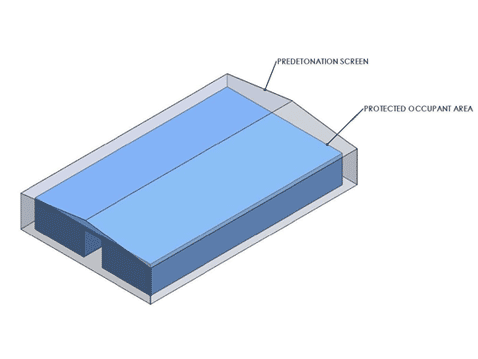 An expeditionary tactical building may be constructed inside a standard prefabricated metal building which protects the tactical building from weather, sandstorms, and adversary observation in addition to providing a weather barrier and standoff screen for pre-detonation of ordnance from direct or indirect fire.